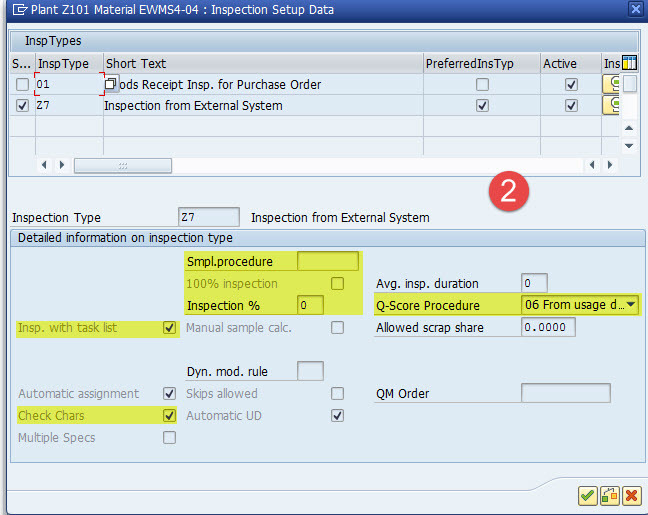 When an Inspection lot is created,highlighted values in screen shot-3 are considered from Inspection rule and the values maintained in quality of material master become redundant. If we have De-central EWM connected to S4 HANA & S4HANA Embedded EWM and if we want to use the same inspection type settings for a given material in both the EWM instances. If we run SAP S/4HANA EWM and have no plans to connect another SAP EWM system to this S/4HANA installation, then we opt for the inspection lot setup to originate from the inspection rule. This means that the inspection rule is the unique place to maintain your inspection lot setup data. Furthermore, you maintain inspection lot setup data not only on single material level but also for material groups by using quality inspection groups. I am using the customizing setting ‘from inspection rule’. But when i create an inspection rule for doc type INB & a certain QI group, system automatically creates a generic inspection rule just for doc type INB. Due to this system is creating IL for products which are not Quality relevant. Any suggestions on how to control creation of generic inspection rule?